Patrick Sharp's 22 goals put him fourth in the league, one behind teammate Patrick Kane. If one didn’t know any better, he might think that the Chicago Blackhawks were playing in the glory days of the 1980s when scoring was as plentiful as helmetless players and back-checking was optional. 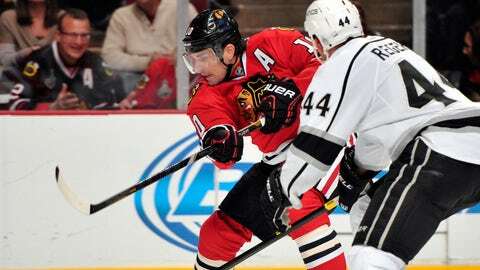 Lately, the hottest of many hot Blackhawks players is forward Patrick Sharp, who was named the NHL’s first star of the week for scoring six goals last week. He has 22, ranking him fourth in the league, one behind teammate Patrick Kane. The Blackhawks boast three of the top 11 in the league in points plus the league’s leader in points among defensemen in Duncan Keith. Keith, having another Norris Trophy-caliber season, is tied for second in the league in assists with 36, putting him on a pace for 70 assists — a plateau that no defenseman has reached in almost two decades. Keith’s partner Brent Seabrook ranks sixth among NHL defensemen in points. The Blackhawks are such a scoring juggernaut that one NHL goalie told Penalty Minutes earlier this season that when facing the Blackhawks, a goalie has to have his best game of the year to win, otherwise he could easily end up getting pulled. Sharp, in particular, is having such a great season that he is making the choices for the 14 forwards on the Canadian Olympic team extremely difficult on general manager Steve Yzerman, a point made by Eric Duhatschek of Canada’s ‘Globe and Mail.’ Blackhawks center Jonathan Toews, a lock to make team Canada, has lobbied to have Sharp on the team. At this point, it’s hard to see how Sharp would not be on it. "I don’t think that’s even an option," Toews said of Sharp in Chicago’s ‘Daily Herald.’ "I think he’s shown everything he can do throughout his career since the last Olympics and throughout the season. I don’t think there are any holes in his game. Obviously, he’s scoring, but he’s doing a lot of other things, too, and is a big reason why our line is successful right now and our team is successful, not only this year but in the playoffs." In terms of success, the defending Stanley Cup champions entered Monday with the best record in the league — even with Anaheim, owner of the league’s No. 2 record, having a 10-game winning streak snapped on Sunday. Sharp is just the latest and hottest among the Blackhawks’ embarrassment of riches. Hurricanes captain’s Eric Stall has a minus-17 rating, which ranks 788th in the league. For a franchise that hopes to earn its first playoff berth in five years, the Carolina Hurricanes are floundering. If, as the hockey cliche goes, the Hurricanes need their best players to play their best, they have failed miserably of late. 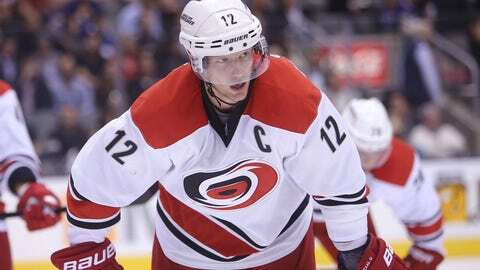 Take, for example, the following trio of forwards: captain Eric Staal, Jeff Skinner and Tuomo Ruutu. In the last five games, that group has two goals, two assists and is a combined minus-28. Each of them registered an unsightly minus-4 on Sunday in a 5-2 loss to Toronto. Staal, presumably about to go off to play on the Canadian Olympic team in a few weeks, holds a minus-17 rating, ranking him 788th in the NHL. Not exactly the kind of number associated with an elite player. On Tuesday after his team’s morning skate, coach Kirk Muller was trying to look for the positives. The ‘Canes might be scoring at decent enough pace to win but they’re giving up goals in bunches: 20 in the past five games. Not surprisingly, they are winless in their last five (0-3-2) and own the worst mark in the NHL over their past 10 games entering Tuesday (2-4-4). "Our better players have to play a little better," Muller said. "They know that . . . but there’s more positives around there than negatives." While they play in by far the worst division in the league, the Metropolitan, the ‘Canes still sit five points out of the Eastern Conference’s final playoff spot, 13th in the conference. Adding to the "when it rains, it pours" category was the news that came during the holiday shutdown that wing Jiri Tlusty had to undergo an emergency appendectomy and would miss two to three weeks. With six goals and four assists, Tlusly has grossly underperformed compared to his career season in 2012-13 when his 23 goals tied for the fifth most in the NHL — but the ‘Canes could still use him. Among the ‘Canes’ numerous issues also has been woeful special teams. Their power play ranks 27th in the league at a meager 13.9 percent and their penalty kill is 20th at 80.8 percent. General manager Jim Rutherford reportedly held a one-hour meeting on Monday with Muller and vice president of hockey operations Ron Francis. That day, he traded wing Kevin Westgarth, who had played only 12 games this season, to Calgary and said a deal for a goalie remains a possibility, along with other potential changes. The ‘Canes currently are carrying three goalies on their roster. Former Conn Smythe Trophy winner Cam Ward (3.10 goals-against average, .898 save percentage) has been injured but, in general, has been off his game. Justin Peters (7-9-4, 2.38 GAA, .922 save percentage) has played well at times and Anton Khudobin rejoined the team on Monday after a two-game minor-league conditioning assignment. Khudobin has not played for the ‘Canes since Oct. 13 when he suffered a lower-body injury. He was 2-0 at the time. "We feel we’re playing well enough to win games, it’s just a matter of finishing them off," Muller said. "It’s the bottom line. We feel like we’re beating ourselves more so than our opponents so that’s the part we’ve got to correct." The ‘Canes have endured their share of bad luck in recent seasons with injuries to Ward last season and this one, an injury to high-scoring wing Alex Semin this season and the news in the preseason that top defenseman Joni Pitkanen would miss the entire season. Nonetheless, the ‘Canes need to start making their own luck. Having spent the past four seasons on the outside of the postseason looking in, there will be no excuses come the spring — especially playing in the Metropolitan. The Blues downed league-leader in points Chicago 6-5 last week, keeping them unbeaten against their Central Division rival this season. The Blackhawks’ 158 goals-for are 21 more than No. 2 St. Louis. The Ducks had a 10-game winning streak snapped by San Jose 3-1 on Sunday. Marc-Andre Fleury’s 22 wins lead the league. The Sharks have won four straight. Don’t look now but the Panthers are only seven points out of a playoff spot. Entering Tuesday, the Flames have not scored since three-day holiday break ended, a span of 125 minutes 5 seconds (and also eight days). The Islanders rallied from a 3-0 deficit last week for a 5-4 win over Minnesota. Devan Dubnyk posted his second shutout last week, 2-0 over Calgary. Goalie Ryan Miller still remains one of the league’s best: .927 save percentage ranks top 10 even with a 10-17-1 record. This game offers a wonderful intersection of contrasts. The Ducks entered Tuesday unbeaten in regulation at the Honda Center this season at 14-0-2. Meanwhile, Boston is 6-2-2 against the Western Conference and 5-1 against the Pacific Division — the toughest in the league from top to bottom. The Bruins, however, are fairly middling on the road: 10-8-0 for 20 points (15th in the NHL). Defensively, the Bruins have the second-lowest team goals-against average in the league at 2.01 behind No. 1 goalie Tuukka Rask while the Ducks rank third in the league in goals-per-game at 3.15 with both Corey Perry and Ryan Getzlaf in the top six in points. It’s not a huge stretch to say these two teams could play for the Stanley Cup in June. 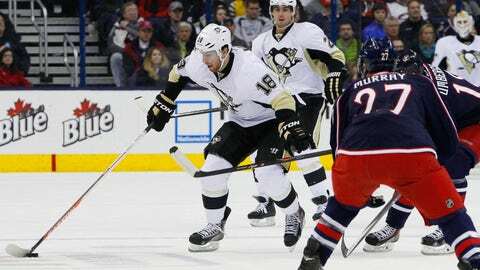 The Penguins’ James Neal had a hat trick and two assists in Sunday’s win over the Blackhawks. In a 5-3 win over Columbus on Sunday, Neal put up five points: a hat trick and two assists. He also had four penalty minutes in 17:44. Somehow, oddly, he finished with an even rating, as three of his points came on a Penguins’ power play that went 3 for 6. That means he also was on ice for two Blue Jackets’ goals. Neal could pick up his defensively play a bit — he’s plus-2 (seventh among the team’s forwards) while teammate Chris Kunitz leads the NHL at plus-21. As the NHL prepares to celebrate its annual Winter Classic — perhaps the best idea the league has had since it changed the rules to allow defensemen to cross the blue line — we thought we would take a look at part of what makes the game special. If there is a better messenger of goodwill for the game of hockey, it’s hard to think of one. Still, the league has had to have its share of luck on its side for that goodwill to be absorbed osmosis-like to the general public. Perhaps another element of luck came in the form of college football’s Bowl Championship Series. Formerly, New Year’s Day television was dominated by bowl games that helped to crown a national champion. But by 2008, the BCS had spread out — and watered down — its schedule so much past Jan. 1 that it left an opening on a day when it traditionally had a lock. The Winter Classic exploited that and has continued its success by using some of the most classic venues in American pro sports: Fenway Park, Wrigley Field and, this year, the University of Michigan’s 105,000-seat football stadium. The event is a winner not only from a national television audience standpoint but also from that of a revenue standpoint — which is why it spurred this year’s stadium series to places like Dodger Stadium. In addition to fans, players also love it, which makes for great public relations (think of how NFL players try every excuse possible to get out of the Pro Bowl). Two members of the Washington Capitals who played in the 2011 Winter Classic at Pittsburgh’s Heinz Field told Penalty Minutes about what a sgreat experience they had. For both Nicklas Backstrom and Mike Green, the introductions ranked at the top. "I think it was just a great feeling when you walked out," Backstrom said. "You walked the two teams right besides each other and then into the stadium. I think that was pretty cool in front of a lot of people. It was just a great experience, everything, the whole package." Green remembered the feeling of anticipation in the tunnel, as fireworks went off and a band played. "It was just something I’ll never forget, for sure," Green said. Green said he gets questions from other players who have not competed in one asking about the game and said he thinks every player should get that chance during his career. Asked if he thinks the league could improve upon the event, he could not offer up any. "Honestly, the one I’ve been in, no," he said. "It was one of the best experiences I’ve ever had." Over the years, the league has expanded the festival-like atmosphere of the Classic to include numerous ancillary events. Nashville Predators television analyst Terry Crisp coached in the Flyers’ alumni game last year. "The greatest thing is just to see it," said Crisp, 70, who played in the ’60s and ’70s and coached the Calgary Flames to the Stanley Cup in 1989. "People come in the cold and the dressing room is the most fun. You sort of wander back and forth in the dressing rooms between the players. They played against each other for years and years — the stories and the rivalries to kibbutz about and the camaraderie comes out and the cheap shots and the barbs come out. It’s just a whole lot of fun. It’s almost like a one-upmanship: who can insult the other the best — in good nature." Green in Calgary, Backstrom in Gavle, Sweden, and Crisp in Parry Sound, Ontario, all grew up playing outdoors. Many who grow up playing the game today in more urban parts of the United States or those locations where it doesn’t get cold enough for ponds and lakes to freeze over do not know that feeling of playing under the open sky. Crisp said that exporting that aura is part of the Classic’s magic. "I think the outdoor hockey, the kids never ever had a chance to come to these games and the parents who bring them to the games probably didn’t have a chance to play outdoors and to even realize what it’s like to play on open pond, an open river, an open lake, an open backyard," he said. "It just gives you a bit of a feeling, a bit of an ambience of this is what it would’ve been like back when there were no referees and no coaches and it was just a bunch of guys and a puck — if you were lucky, you had two pucks in case one went in one of the holes in the river or a snow bank and you couldn’t back it again and just go. To me, that’s sort of what it brings back."